DONETSK, Ukraine -- The Donetsk People's Republic is starting to smell. Rotting garbage is piling up in the hallways of the government office building seized by separatists in eastern Ukraine. Denis Pushilin, self-proclaimed leader of the insurgency that has declared an independent "people's republik" in the Donetsk region, speaks at a news conference in eastern Ukraine city of Donetsk. Telephones ripped from the walls are piled atop broken furniture and mounds of old files. The stench of sweat and stale cigarettes is everywhere. The guards, slouching men with pistols shoved in their pockets or flapping loosely in holsters, look increasingly bored. It's been six weeks since they took over the building, a week since they declared independence from Ukraine. But the authority of the alleged nation barely extends beyond their ten-story office tower and a few heavily armed checkpoints on roads leading into this industrial city 80 kilometers (50 miles) from the Russian border. In the streets of Donetsk, the separatist leaders and their followers are increasingly derided as a collection of heavily armed, barely employed misfits. Outside of the rebels' headquarters, it can be difficult to find anyone who agrees with their calls to secede from Ukraine and link this part of the country — with its generations of ethnic and linguistic ties to Russia — to Moscow. "All this shouting about us being a republic. What kind of a republic is this?" asked Leonid Krivonos, a 75-year-old retired miner, angry that the separatists are refusing to allow Ukraine's upcoming presidential election. "The young ones still have a future to look forward to, and they risk seeing that all destroyed." The interim Ukrainian government hopes Sunday's presidential election will unite the country behind a new leader, but separatists across the east have vowed to block the vote. Donetsk's separatist leader waves away any prospect of an election. 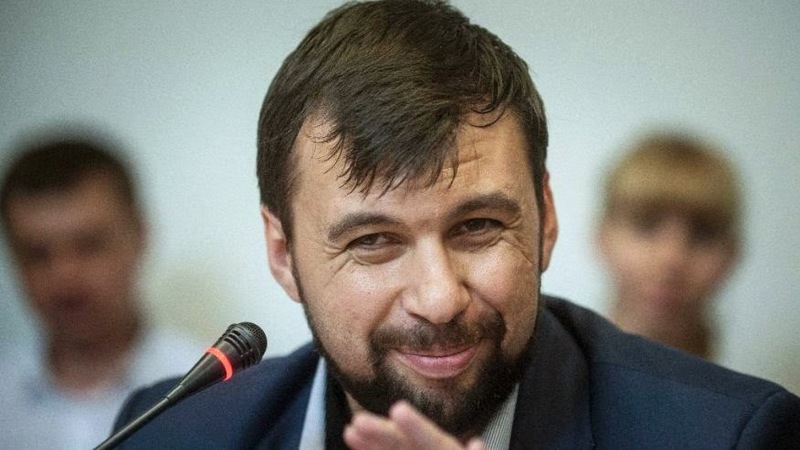 After all, insists Denis Pushilin, chairman of the self-declared Supreme Council, Donetsk is not in Ukraine anymore. "How can we hold an election of a neighboring country on our territory?" said the 32-year-old Pushilin, smiling in an interview in his tenth-floor office. If the tide of opinion has appeared to turn against the separatists recently — with Russian President Vladimir Putin supporting Ukraine's presidential election and billionaire industrialist Rinat Akhmetov calling on his 300,000 employees to stand up to the mutineers — Pushilin is unconcerned. His movement's support is vast, he says, extending north from the Azov Sea for hundreds of miles (kilometers) in eastern Ukraine. "It's people from different towns, from different political views, from different political organizations," he said. His skin is pale from weeks spent living and working in the building. But Pushilin has a talent for words. Until recently, he was a salesman for a pyramid scheme that attracted millions of Russians and Ukrainians ("Financial pyramids are not forbidden and are not illegal," he said, explaining his involvement). Talking points spill from him effortlessly. "The junta in Kiev has destroyed Ukraine as a state," he said, insisting his government is supported "by all the people who live in the region." Polling — and residents — say otherwise. An April survey by the nonpartisan Washington-based Pew Research Center found that 77 percent of Ukrainians want the country to maintain its current borders, with the number falling to 70 percent in eastern Ukraine. The percentage drops more among Russian-speakers but even 58 percent of them want the country to remain unified. "Ukraine is one country, and should stay as one country," said a retired high school teacher who asked to only be identified by her first name, Lyudmila, fearful of criticizing the separatists. She wants unity even though, like many people in the east, she detests the interim government in Kiev. "Our natural disaster," she called them on a recent morning, working in a flower-filled garden behind her apartment building. Distrusting politicians is second nature to many Ukrainians, frustrated by years of crippling corruption. But those suspicions are magnified in the east, where people see a central government in Kiev dominated by Ukrainian-speaking westerners who rose to power after protests prompted President Viktor Yanukovych to flee to Russia in February. Ukraine's complex divisions emerged from centuries of war and politics, but today's divide largely plays out between a Ukrainian-speaking west, where most people are eager to join the European Union, and a Russian-speaking east rooted in ties to the Soviet Union and Russia. The divide was magnified a few days after Yanukovych fled, when Putin deployed soldiers in Crimea, Ukraine's Russian-speaking Black Sea peninsula. He then annexed Crimea in March. Soon, separatist uprisings were flaring across the Russian-speaking east, with mutineers believing they, too, would be annexed by Russia. Donetsk, the largest city in eastern Ukraine with nearly 1 million residents, has the largest self-proclaimed government, with a cabinet, a legislature and its media-friendly leader. It has a flag and a press department that issues credentials to reporters. A foreign ministry office is in the works. What it doesn't have is a country. Except at their headquarters, the separatists are rarely seen in the city. When they do appear in public, as they did briefly Tuesday, descending from an armored vehicle on a city street to display their weapons and insist they were keeping order, their actions seem more like intimidation than anything else. People glance around nervously as they speak of the separatists. Some critics have been beaten. "They can chase you, track you down," said a local businesswoman who asked to be identified only as Angela. A Donetsk teacher named Antonina said she and her family received death threats from the separatists because she was on the local election commission preparing for the presidential vote. She said gunmen stormed a meeting and seized all the voting documents. "I am really scared for my children," she said, asking that her last name not be used. Meanwhile, in Slavyansk, a city in the Donetsk region where rebels and Ukrainian troops have been trading gunfire for weeks, an angry crowd of 200 heckled a separatist commander Tuesday, complaining that the rebels were drawing retaliatory fire toward their homes. In Donetsk, though, life functions despite the separatists. Schools, stores and offices are open. The city's streets are busy. The summer heat has come early this year and the parks are full of young couples. The police and the city's elected officials are lying low but basic services — water, electricity, the fire department — are operating normally. Pushilin acknowledges his movement emerged in "a chaotic way" but clearly wants it to look serious. On Monday, the separatists called the first meeting of their Supreme Council, gathering in an auditorium in their headquarters. About 20 percent of the group was armed, carrying everything from hunting knives to assault rifles. A handful wore body armor. There was an abundance of homemade tattoos, a variety of camouflage and lots of tight black T-shirts. Few in the room, including the organizers, appeared to know what to do. After selecting a deputy for the Supreme Council — the vote for the only candidate was unanimous — an official announced that people were needed to staff various departments. A young man walked to the front of the auditorium, took the microphone and said he wanted a job. "I want to do something with agriculture," he said. His campaign speech was short: "Will you vote for me? Please support me." A few hands went up, apparently votes in his favor, but someone else grabbed the microphone and asked the man to sit down. Other people stood to make speeches. An angry man wanted to discuss a possible constitution. The new deputy speaker spoke about the need to find experts for the foreign ministry. As the situation grew increasingly chaotic, Pushilin, facing the gathering from the stage, took the microphone. "You are acting like you are in a kindergarten and not a Supreme Council!" he said, glaring at the room, which quickly went silent. Many people hung their heads. Minutes later, the session was adjourned. There was no word if the young man's hopes for a job had materialized.